15 minutes of DVD data were recorded at high quality for the image and for dark-frames. The BMPs were extracted from the DVD VOB files. 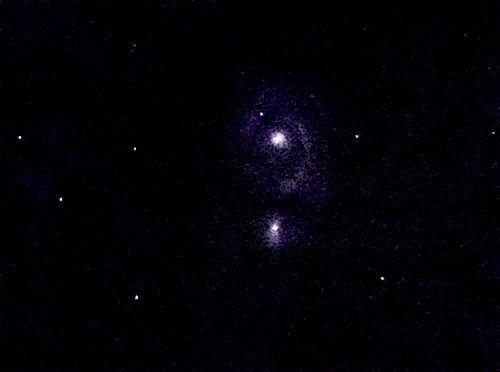 Dark-Frame Scaler was used to scale the dark-frame correctly and the images were dark-frame corrected, derotated and stacked in Deep Sky Stacker. In this image the black ringing around the stars has been eliminated. The noise reduction settings and the sharpening will be investigated further to optimise them. Below is a single frame to approximate the live view. The live view gave very pleasing and correct colours and was a good observing experience. The colour of the live view was very pleasing for observational use. The camera did quite well with the 130mm , f/5 Newtonian. The SDC-435 has a built in noise reduction function that is intended to be used in low light environments. It is important to use this function, particularly if the camera is being used as an observation camera and the image on the TV monitor is to be observed. The noise has been drastically reduced but the stars in the image remain unaffected. For the procuction of images, dark-frame subtraction using dark-frame scaling removes the amp glow in the top left of the image. The modified Samsung SDC-435 was used with slightly changed white balance values and noise reduction. 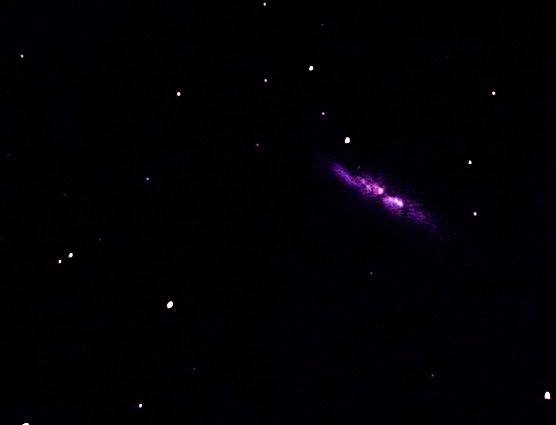 The camera was fitted with a light-pollution filter and was placed at the prime focus of the 11" f/10 SCT. Dark-frame and image data were recorded to DVD in high quality. The BMP frames were recovered from the DVD with VOB Frame Extractor and the frames were stacked in Registax. The aspect ratios were corrected and levels were adjusted in the Gimp. The white balance has been improved with the current settings. On June 25-26, with a bright Moon in the sky I tested the Samsung SDC-435 frame-accumulating video camera that I have tested previously and have now modified by removing the dichroic filter assembly that makes the normal camera insensitive to H-alpha light. I fitted a light-pollution filter on the camera and mounted it at the prime focus of the 11"SCT. 15min of DVD (1 Vob file) were captured at high quality and a similar amount of dark-frame data were recorded. There was a bright Moon in the sky. The VOB Frame Extractor software coded by Ian Davies was used to extract BMP images from the DVD with no loss of quality. Andrew Sprott�s Dark Frame Scaler program was used to correctly scale the raw darkframe produced by Registax. The BMPs were dark-frame corrected and stacked in Registax. The resulting image was aspect-ratio corrected and cropped. This camera is looking promising. The modification and modified settings. On June 11th I recorded 30 minutes of data onto DVD of the Ring Nebula at the prime focus of an 11? F/10 SCT mounted on a Synscan HEQ5 equatorial mount. This amounts to two VOBs of data. I used our VOB File Extractor software to extract BMP images with no loss of quality from the DVD. The conditions were quite windy at capture time so many frames had to be discarded. The data were dark-frame corrected using a dark-frame scaled with our Dark-frame Scaler software. Registax stacked the useable images. The image is not well focussed due to the wind and the unmodified camera did not see much of the H-alpha light. On Tuesday June 1 I tested the Samsung SDC-435 on an altazimuth mounted 130mm f/5 Newtonian. The data were recorded to DVD at high quality for 15min per object. 15min creates 1 VOB (video Object file) on the DVD. The images were later recovered from the DVD with no loss of quality using our VOB Frame extractor program as featured in December 2009 Astronomy Now. The images were stacked with de-rotation in Deep Sky Stacker and were dark-frame corrected using scaled dark frames produced with our Dark-Frame Scaler program as featured in the April-June issue of Popular Astronomy. More data were required than were captured for this image which was very faint. 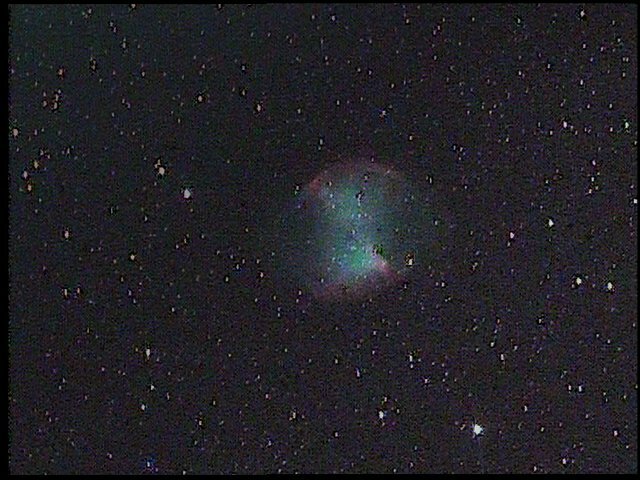 Even with a very small scope, this camera did quite well. It is my intention to explore this colour camera unmodified and then to attempt to reversibly remove the blue dichroic filter from in front of the chip that is responsible for blocking much of the H-alpha light. Then a fair comparison with the Mintron Helix and Omega cameras can be made. 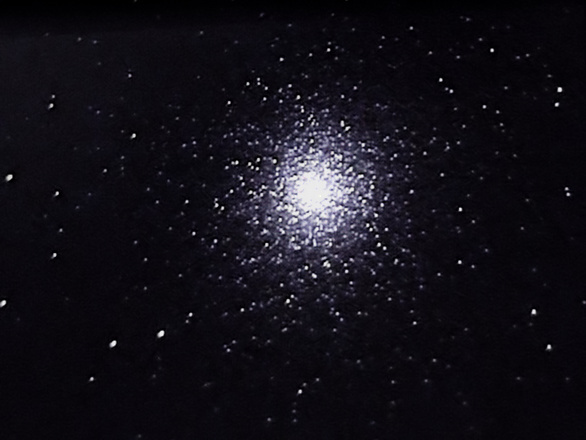 I used the Samsung SDC-435 video camera fitted with a light pollution filter, with an 10" f/4.8 Newtonian. Capturing AVIs of 100 or 150 frames at 5s intervals using a Kworld DVD Maker capture card and the AstroVideo software. A 100 frame Dark Frame AVI was captured and processed in Registax to produce a dark frame. The dark frame was then scaled with Dark Frame Scaler to produce a suitable dark frame to use in Registax with the AVI captured of each object. The preview images had a fair amount of colour noise. On April 23 I tested the (DIS) Digital Image Stabilisation function of the SDC-435 on Video of the Moon Taken through a Skymax 127 Maksutov. 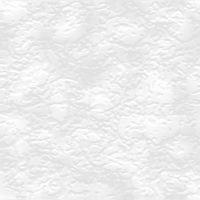 The function is supposed to mitigate against image movement. However the most noticeable effect was that when DIS was selected, the image zoomed a little as can be seen in the images below. 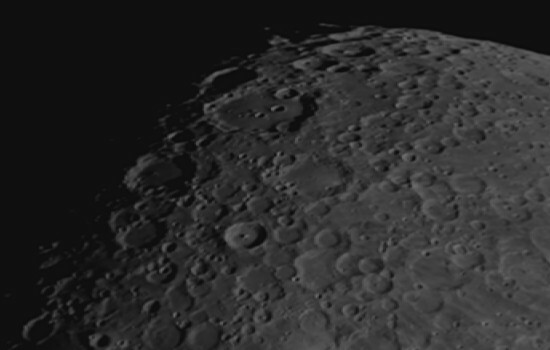 Note the size of the Crater Clavius on each image. Under the still conditions where the only image movement was due to atmospheric seeing, there was no obvious advantage of using DIS. In fact, the zoom effect of this function decreased the field of view. The Samsung SDC-435 video camera has a SSDR (Samsung Super Dynamic Range) setting that is very useful for Lunar imaging. 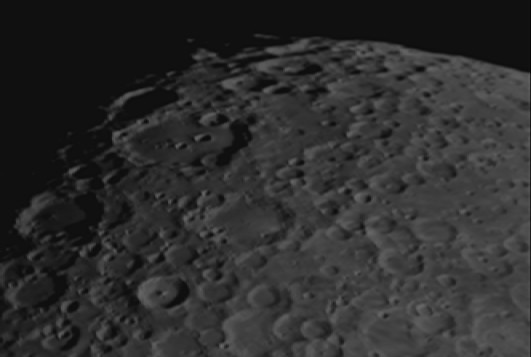 The Alpine Valley region of the Moon was imaged by capturing a 1000 frame AVI using the Astrovideo software and a KWORLD DVD Maker USB 2.0 capture card. This was done with SSDR turned off and again with SSDR turned on. In each case the best 550 frames were stacked in Registax. I attached the camera to a 10" f/4.8 Newtonian reflector telescope and used Astrovideo to capture 100 frame AVIs with a 5s delay between the capture of individual frames. The sens was set to auto and max accumulation of 512. AGC was set to high and the camera was set to colour. A 100 frame dark-frame AVI was captured with fixed align with the cap on the front of the scope. The camera adjusted automatically so that the dark-frame was far too light as discussed for Mintron Dark Frames in our article in �Popular Astronomy� April-June 2010. Astrovideo also simultaneously tracked and summed the captured frames and produced an image that was saved as a .BMP file. This image was then used along with the dark-frame in Dark-Frame-Scaler to produce a corrected dark-frame for use with the AVI in Registax. I shall investigate camera settings to see whether the colour balance can be improved. The blueish tinted filter that filters out IR in front of the 1/3" chip will also cut down H-alpha to levels that could be below 20% of their actual values. I shall look into the possibility of modifying the camera by removing this filter in the future. My intitial reaction is that this camera can be used for Deep Sky observing and imaging although the live views have a fair bit of colour noise. I shall also evaluate the camera as a lunar and planetary imager.